Are kids today just not as bright? That’s my question when I see young skiers and riders flying off of big jumps, landing on hard packed snow. That’s got to hurt, unless you are a crash test dummy. I don’t like to imply that today’s youth are dumb, maybe they’re just “numb.” As a parent I cringe as I watch kids hurl themselves high in the air and then come down with serious impact. It’s an average day to see some young huckster being taken out of the park on a sled. That’s no way to end the day, though it certainly punctuates the jump – and makes my point. When you watch the Olympic aerialist, you see a whole team of jump technicians with shovels fluffing up the snowy landing ramp. I don’t see the same cushy white carpet treatment in most ski area terrain parks, but I see plenty of amateurs going off massive machine made jumps landing on groomed but very firm machine made snow. 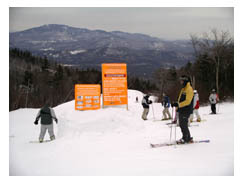 Before ski areas starting creating monster jumps in designated terrain parks, kids would have to create their own jumps, and the size was considerably smaller – given the limited resources: hands, shovels, and natural snow. Today’s jumps are 20-40-feet high, making the consequential landing that much more significant even with the latest impact-absorbing boots and boards. A “hard landing” recently hit home with us, as our daughter fractured her knee from a particularly hard landing off a jump. Perhaps parents, myself included – albeit a month too late, need to school their new schoolers that just because a jump is there, doesn’t mean it’s safe. You need to know your ability, and seek out optimal conditions before your throw yourself to the mercy of the big kicker. There’s a reason they call these jumps “kickers” and “hits.” They will kick you and hit you hard if you aren’t prepared and skilled. Those four points cover a bunch. 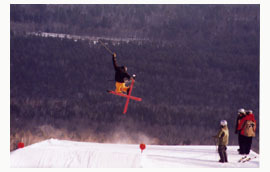 A pre-jump run is essential to size up the feature and the landing – to be sure you can handle it. If a lump grows in your throat during this inspection run, that’s a sign you should skip this lip. I would add #5 jumping on hard snowpack will inevitably lead to a hard landing…but that’s just me, an old-school mom, talking.